Boris Johnson has issued a call for Theresa May to tear up her “miserable” plans for close relations with the European Union after Brexit and return to the “glorious vision” of Global Britain which she set out last year. 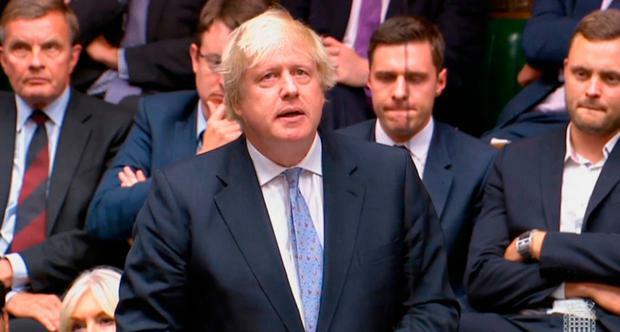 In a highly-charged personal statement to the House of Commons following his resignation as foreign secretary, Mr Johnson did not make a direct challenge to Mrs May’s position as Prime Minister and Conservative leader. But he denounced the plan agreed at Chequers and set out in the PM’s white paper last week as a “Brexit in name only” which would leave the UK in a state of “vassalage”. And he left no doubt of his intention to put himself at the head of Tory backbench forces demanding a return to Mrs May’s original red lines of total withdrawal from the customs union and single market in order to allow Britain the unfettered ability to forge trade deals around the world. Accusing the Government of “dithering” over its Brexit negotiations, he said that a “fog of self-doubt” had descended on Mrs May’s stance to EU withdrawal since she first set it out in a speech at Lancaster House last year. In a 12-minute statement, he said: “It is not too late to save Brexit. “We have time in these negotiations. “We have changed tack once and we can change again. “The problem is not that we have failed to make the case for a free trade agreement of the kind spelt out at Lancaster House. Mrs May was not present to hear Mr Johnson’s statement, as she was answering questions on Brexit from senior MPs at a long-planned hearing of the House of Commons Liaison Committee. The Uxbridge MP made a point of praising “her courage and her resilience” and indicated that he thought she could lead the UK to a successful Brexit if she was willing to change tack. – Allowed the issue of the Northern Irish border to dominate the debate. He said he could neither support nor accept the Brexit vision which he and other Cabinet members signed up to at Chequers. “Let us again aim explicitly for that glorious vision of Lancaster House – a strong, independent self-governing Britain that is genuinely open to the world, not the miserable permanent limbo of Chequers,” said Mr Johnson. “Not the democratic disaster of ongoing harmonisation with no way out and no say for the UK. And he said Britain should be “great independent actors” on the world stage, not “rule takers”. “That was the vision of Brexit that we fought for,” he said. “That was the vision that the Prime Minister rightly described last year. Mr Johnson dismissed Mrs May’s facilitated customs arrangement plan for the Irish border as a “fantastical Heath Robinson” creation. And he complained that his own suggestions for technical solutions to keep the border open had never been “properly examined”, but were treated as a “taboo” following the agreement of a backstop arrangement last December. Mrs May’s white paper would restrict ministers’ powers to initiate, innovate or deviate from the Brussels rule book to the extent that they would never again be able to institute a reform programme of the type introduced by Margaret Thatcher in the 1980s, he said. He warned the Prime Minister not to “make the fatal mistake of underestimating the intelligence of the public, saying one thing to the EU about what we are really doing and pretending another to the electorate”. The statement won support from Nigel Farage, but the former Ukip leader made clear he did not believe the Brexit desired by Mr Johnson could ever be delivered by Mrs May. “A very well delivered speech from Boris but it is hopeless to expect Mrs May to deliver on any of it,” said Mr Farage. But the former foreign secretary was mocked by pro-EU MPs. And Wes Streeting, a supporter of the People’s Vote campaign for a second referendum, said: “Boris Johnson’s speech was a total damp squib. All it shows is that while the car is careering towards the Brexit cliff-edge, senior Conservatives are still fighting over what song to play on the stereo. Rachael Burnett Police are appealing for information after a three-year-old boy was seriously injured in a suspected acid attack. Lucinda Cameron Family and friends of a six-year-old girl who was killed on holiday have said farewell to a “special little girl” at her funeral. Pat Hurst A woman was hit with a roof slate before being raped, police said.